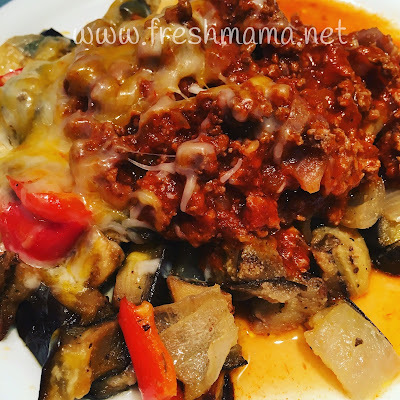 Fresh Mama Fitness and Health: No pasta? No problem - low carb, gluten free alternative to your pasta dinner! No pasta? 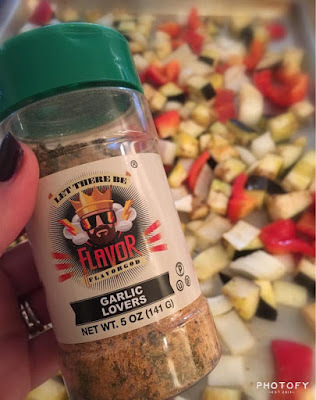 No problem - low carb, gluten free alternative to your pasta dinner! Fact: most of my best recipes were nothing short of a happy accident - this newest one included. I've done the spaghetti squash and zucchini "noodles", both excellent choices, but why not try something a little different?! It all started with my Sunday food prep - some eggplant, red bell pepper, and onion paired with my FlavorGod Garlic Lovers seasoning - the original intention was to have the roasted veggies on hand as a side dish for Mike's lunches (gotta get those veggies in!). Then the crew wanted pasta for Sunday dinner....but Mom's not eating carbs after 2pm so - what's a girl to do??? In comes the roasted veggies and voila! I popped some Crockpot Meat Sauce - in the slow cooker and there you have it.... a delicious, low carb + filling meal that works for all of us. The boys had pasta with some of the veggies and sauce - I had veggies with sauce. Yum! 5) Roast for 25-30 minutes, checking to toss and turn every 10 minutes - veggies are done when golden brown and yes - it will smell amazing! Serve as a side dish or top with meat sauce - perfect fresh out of the oven or reheat and use for your veggies during the week! Also delicious on salads or mixed in a quinoa salad. Seriously, the possibilities are endless! Need a little help planning your weekly shopping trip? Grab my exact weekly shopping list and pantry staples list HERE!